In the Germany of the early 20th century, the American eugenics programs was looked upon and even invoked as models to be emulated. The immediate thought that comes to mind in early 21st century America is that here in the U.S., the socialized medical care of European and other nations is now looked upon and even invoked as models to be emulated. Do you see the connection? Is the pattern clear to you also? Of course today these nations that have government run healthcare go to extreme lengths not to use the term "eugenics," and there are just too many terms and names to list here. None-the-less, a rose is a rose by any name. The policies of these governments that provide healthcare still reflect the eugenicists' vision of the past. Control the birth rate, ration healthcare and medicine and restrict availability of various treatments and procedures. Let's not forget the efforts of many nations to eliminate the births of "defective" children by abortion, and segregate the aged, mentally challenged and physically deformed by whatever means are available, just as long as the "fit" do not have to look upon the "unfit." In 1905 the German Society for Race Hygiene was founded. This organization was run by the elitists that were alarmed by the declining fertility of the professional classes and the increase in birthrates among those considered the less desirables of German society. Support for this organization came from political liberals, socialists and conservatives. There were even some Jewish geneticists involved such as Richard Goldschmidt, Frank Kallmann, and Curt Stern, who were active eugenicists. What all the members of the Society had was a shared vision of the nation's health as a public resource and a belief that its problems could be solved through the breeding of a fit and healthy population. You may find it as shocking as I did that Jewish scientists could actually have been involved in such work for the German government. But on further research, I am certain that they never would have thought that their work would have ever been used against their own families at some point in the near future. Now think about this; Mr. Obama does have a number of people of Jewish heritage working for him to help promote his agendas. 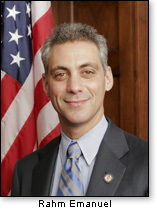 Rahm Emanuel is probably the most recognizable by face & name. Mr. Emanuel is the son of a Jerusalem-born Jewish pediatrician. His uncle was killed by Palestinian's, and his father fought against them as well. Rahm has a brother named Ezekiel Emanuel. He is an oncologist and medical advisor to the White House. Both these men have a sister who is stricken with cerebral palsy. I have to ask if these men, especially Rahm Emanuel, ever consider the possibility the very policies he is supporting will someday be used against his family in some twisted way. Could policies either buried in the healthcare reform bill or that may be amended to it later adversely affect the quality of care their sister receives? I'm sure the Jewish scientists working for the Germans never thought in a thousand years that their own families would fall victim to the very government they supported and loved. Do not say it cannot happen in America. As we are seeing, it already has once before. Like the members of the German Society for Race Hygiene, many in American government share a vision that the nation's health is a public resource to be managed and that many of the problems we are now facing can be solved through genetic engineering, selective breeding, sterilization, abortion of the unwanted and euthanasia of the "unfit" and "undesirables." In the early decades of the 20th century, eugenics found much of it funding coming from corporate philanthropies like The Rockefeller Foundation, the Carnegie Institution and the Harriman railroad fortune, just to name a few. These corporations joined with respected scientists from some of America's most prestigious universities such as Stamford, Yale, Harvard and Princeton. They all believed that eugenics was good science; good for the nation, good for mankind, good for the future. They promoted race theory and race science and would alter and manufacture data to serve their racist agenda. 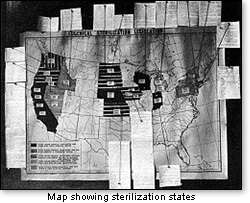 In California, where forced sterilization was becoming common and accepted, Dr. Paul Popenoe, Paul Gosney and Charles M. Goethe became involved in the work of eugenics and formed very close relations with other eugenicists. In 1918 Popenoe co-authored with Roswell Johnson the textbook, Applied Eugenics. In it he said, "From an historical point of view, the first method which presents itself is execution...its value in keeping up the standard of the race should not be underestimated." The most commonly suggested form of eugenicide in America was called the "lethal chamber" or public locally operated gas chambers. His book also devoted a chapter to "Lethal Selection" which promoted "through the destruction of the individual by some adverse feature of the environment, such as excessive cold, or bacteria, or by bodily deficiency." California eugenicists published booklets and circulated them to German officials and scientists. During the 1920's, the superintendent for the Eugenics Record Office, began to report on German developments in the bulletin of the American Eugenics Society. He also began to report on American eugenics in German journals. Fritz Lenz, an influential German geneticist established good relations with Laughlin, Charles Davenport and Popenoe. Popenoe also reported on American research in the journal of the German eugenics movement. Research information was not the only thing the Germans were receiving from the states. 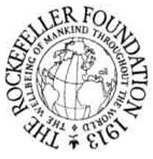 The Rockefeller Foundation, as well as other private entities began to pour money into German eugenics research. By 1926, The Rockefeller Foundation had given $410,000 ($4 million adjusted for 2009) to hundreds of German researchers. 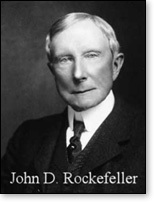 Rockefeller awarded another $250,000 to the German Psychiatric Institute of the Kaiser Wilhelm Institute in May 1926. The Kaiser Wilhelm Institute would later become the Kaiser Wilhelm Institute for Psychiatry. 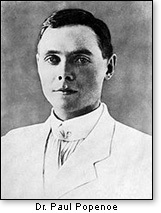 Ernst Rudin became the director and later one of the architects of Adolf Hitler's systematic medical repression. In 1929 Rockefeller gave a grant of $317,000 to the Institute for Brain Research. With this grant, the Institute became the premier location for race biology in Germany. This would not have been possible without the Rockefeller grant. Over the next several years the Institute received regular funding with Rudin at the helm the entire time. The Carnegie Institution eugenics scientists were also developing strong relationships, both personal and professional with the German eugenicists. And there was someone else that was interested in American eugenics and was paying very close attention to the research and developments being made in the states at this time. 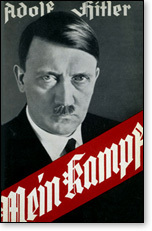 Adolf Hitler's autobiography Mein Kampf was first published in 1924. In it, Hitler quoted American eugenic ideology and openly displayed a thorough knowledge and understanding of American eugenics. He stated in his book, "There is today one state in which at least weak beginnings toward a better conception [of immigration] are noticeable. Of course, it is not our model German Republic, but the United States." Hitler studied American eugenics laws. He attempted to legitimize his anti-Semitic feelings through "good" science and wrap it in a more tasteful package called eugenics. In this way Hitler was more successful in recruiting more followers from among the "reasonable" Germans by claiming that science was on his side and supported his views. You see, the eugenics science Hitler adopted and internalized to support his own twisted views on race was a product of the good old USA. In the 1920's the Nazi party of Germany was not in power yet, but it had great aspirations. It had only been formed in 1919, after the war. Its members in 1919 numbered only a few hundred, including an ambitious Adolf Hitler. Hitler told his Nazi friends how carefully he had studied American eugenics, "I have studied with great interest the laws of several American states concerning prevention of reproduction by people whose progeny would, in all probability, be of no value or be injurious to the racial stock." Hitler even wrote a letter to American eugenic leader Madison Grant to tell him his race-based eugenic book The Passing of the Great Race is his bible. There are striking similarities between the Germany of the 1920's and the United States in the first decade of the 21st century. Adolf Hitler came to power amid a storm of uncertainty for many Germans. The Germany of the 1920's was rocked with an unstable economy still reeling from the devastation of the First World War. Inflation was sky-rocketing and keeping in step with it was high unemployment. Today, our nation is dealing with two wars overseas, the outcome of either is currently uncertain. We also find ourselves constantly vigilant for the next major terrorist attack on U.S. soil. We know its coming...we just do not know when or where. As yet we do not have much in the way of inflation, but that too is coming as our government continues to print money at an unprecedented rate in an effort to stop the inevitable. And of course I do not have to tell you about our current unemployment rate of 9.7%, with unemployment rates in the double digits in some areas of the country. Many Germans didn't really trust the government, yet they turned to the government to solve the many problems facing ordinary people. In the 1920's, Adolf Hitler was just beginning to make a name for himself within the Nazi party, and the Nazi party was just beginning to make a name for itself with the German people. The one thing all Germans wanted desperately was change. They wanted a government they could believe in and trust. They wanted a stable, prosperous and growing economy to pull them out of the ash heap of World War I. They wanted their dignity restored to them on the world stage, and they wanted someone that could lead their nation to accomplish all this and more. They were looking for a messiah. Adolf Hitler's rise within the Nazi party started in 1919, and his success within the party was largely due to his oratory, organizational and promotional skills. Does this remind you at all of Mr. Obama? Both men possess[ed] these same skills, both men came literally out of nowhere and where suddenly catapulted into national prominence within their own party. Adolf Hitler opposed the democratic form of government, so does Mr. Obama. Adolf Hitler was an anti-Semite, so is Mr. Obama. One difference between the two is that Adolf Hitler was an anti-Marxist, but Mr. Obama embraces the Marxist/Communist philosophy and has gone to great lengths to become pals with the likes of Hugo Chavez and the Castro's of Cuba. Adolf Hitler was a socialist; Mr. Obama can also be considered a socialist in the way he is working around the clock to socialize America. Adolf Hitler's book Mein Kampf introduced him to the average German when it was published for the first time in 1924. Mr. Obama's books introduced him to the American public prior to his election as well. Adolf Hitler, in defiance of the Treaty of Versailles, and very quietly so as to not raise any suspicions, militarized Germany in advance of the war he knew was coming. And both men praised the "good" science of the day to help build support for their public and private agendas, despite contradicting better science that was and is available. At recent town hall meetings, union thugs that support Mr. Obama have shown up to intimidate and even assault law abiding American citizens that oppose the healthcare reform bill. In Germany, Adolf Hitler also had thugs that were not afraid to use violence to intimidate and even silence political opposition. During the 1920's and into the early 1930's, the Nazi party gathered enough support to become the most powerful political party in Germany, eventually winning the 1933 election, the last legal election prior to World War II. The Nazi party used a very methodically developed plan of deception, intimidation, bribery, extortion and murder to hold onto the reins of government once they had it. They created also a mythology about the Fuhrer and the Nazi party he commanded. Ironically, the Nazi party referred to the time period from about 1923–1933 as Kampfzeit, or the time of struggle, which you find many American's today referring to the current time we are in as a time of struggle. When Adolf Hitler was elected Chancellor of Germany in 1933, the nation was beside itself with excitement and anticipation for the future. Almost immedietly the changes brought about began to effect in many cases the very people that had helped elect him to power. Little did they know that the very person they thought and hoped would be their national savior would indeed turn out to be of the spirit of anti-Christ. This is exactly what happens when a nation, blinded by ignorance and pride, pins all their hopes on a person and elects him to the highest office in the land, despite the fact he had not only published his own bigotry and race prejudices, but also his undemocratic political beliefs for everyone to read and study. Those that put madmen in high office must be madmen themselves when they choose to ignore history in an effort to gratify their own political ideals knowing full well the consequences for the nation could be catostrophic. The responsibility for the destruction of millions of people and the devastation of an entire continent rests not only with Adolf Hitler, but also with those that put him in power and then defended him to keep him there. We know only too well now just exactly what his views and ideas on race resulted in, but the truth about how his own hatred for others and how it was influenced and encouraged by American eugenics has never really come completely into the light until now. It was American eugenicists, working with their German counter-parts that made the eugenic laws, including segregation laws, possible in Germany under the iron fist of a madman hell-bent on exterminating every race or group of people from the planet that did not fit the Nazi Aryan mold. It was American eugenics that Adolf Hitler admired in the 1920's, that he spoke so highly of. But we will see in part 5 of this column that prior to the outbreak of WWII, it was the American eugenicists that were actually praising the German's for the work they were doing. We will see how when you combine government control with bad science, the end result will be a holocaust, like the holocaust of abortion. 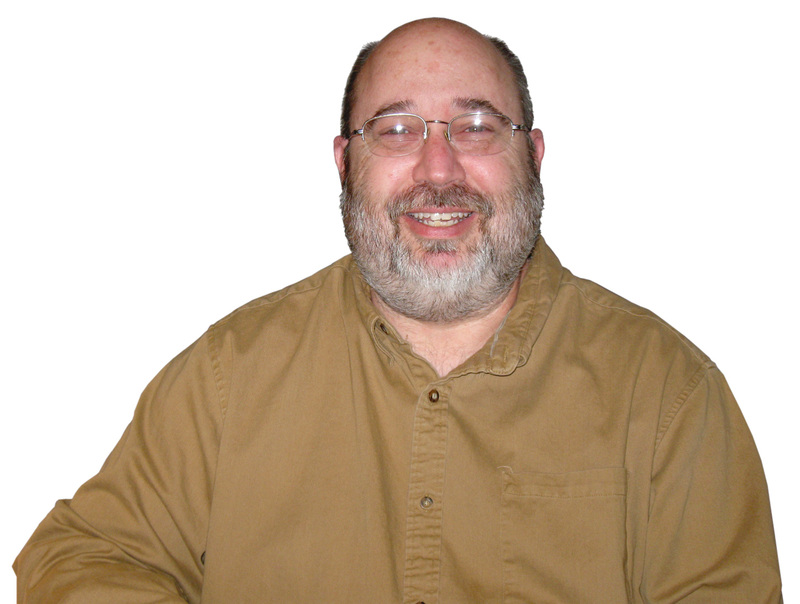 Bob Kemp, an ordained Deacon, husband, father, and Sunday School Teacher, currently works as Concert Coordinator for a multiple Dove Award winning and Grammy Nominee Contemporary Christian Artist at Praise Ministries in Lindale, TX. Bob also writes a monthly article for HeartBeat The Magazine, where he is known as "The Thinker." Bob's articles on Biblical truths and encouragement can be found at web site address www.heartbeatthemagazine.com. He is also a decorated Air Force veteran, having served from 1980–1988. During his service in the Air Force, he was stationed for five years at the National Security Agency.